Solid adventure is a great deal of fun In a lot of ways the film covers well worn ground but at the same time the film has a twist or two that are completely unexpected (and no I won't tell you what they are.) Its the twists that make the film worth watching. 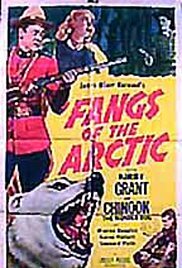 FANGS OF THE ARCTIC was the eighth of nine films in the series and while the film remains polished and well made, the series feels like it kind of was running out of steam. We've been to this well one or two times too many. I wouldn't have been surprised if the series had ended with this film... on the other hand the series didn't and the next film is one of the best in the whole series.